What do the Splendour in the Grass Music Festival in Australia and TOVP have in common? 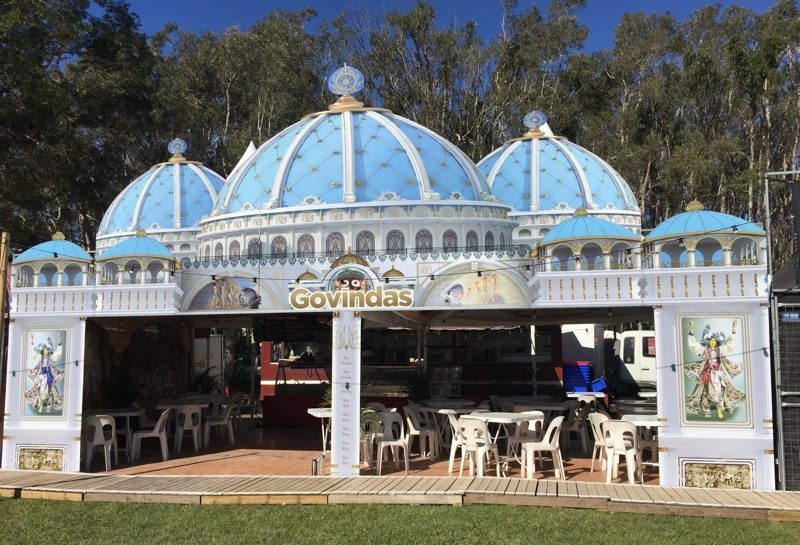 Remarkably, devotees from New Govardhana Farm have set up a Govinda’s prasadam stall there with a theme representing the TOVP itself as the shape of the stall. The Splendour in the Grass Festival is a three day music festival held near Byron Bay, New South Wales since 2001. Ticket sales reach the maximum 25,000 and sell out within 45 minutes, making the attendance a total of 75,000 during the three days. New Govardhana has been attending the festival since 2006 and twelve devotees are part of the Govinda’s prasadam stall crew which cooks and serves the prasadam. For the last two years the devotees decided to use the TOVP theme and have gotten many positive comments and questions about the design. This has also increased prasadam sales and book distribution. The stall was designed and engineered by Krishna Gana das. There’s more than one way to spread the word about the TOVP. Build your own TOVP prasadam stall and get on the TOVP Marathon 22 to build the TOVP by 2022.